Description: Sexes similar. Narrow, pointed, yellow-orange bill, more slender in female than in male. 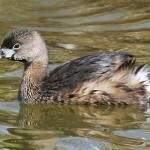 Breeding adult with white belly, foreneck, cheek and throat; upperparts medium to dark gray-brown; black cap not extending down to red eye; blackish stripe down hindneck. Winter birds have medium gray-brown upperparts, cap and hindneck. 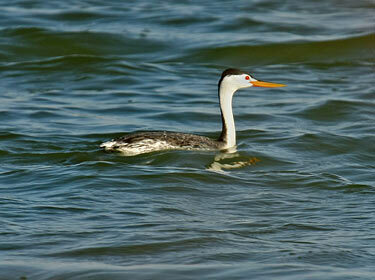 Where in Nebraska: Rare regular spring and fall migrant in the western portion of the state. Also, rare regular breeder in the western Sandhills. Local rare regular summer visiter in the west. Accidental in winter. Most recorded location has been the west end of Lake McConaughy near the Omaha Beach access. 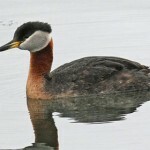 Fun Facts: Once a Clark’s Grebe’s eggs hatch, usually a pair, both parents carry the young on their backs, while feeding them, and do not return to the nest. 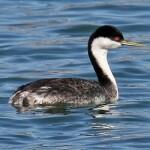 Additional Information: Formerly considered one species with Western Grebe; hybrids are occasionally seen.